Harper's Weekly was the most popular newspaper of the Civil War period. These newspapers have analyses of the war created by people watching it unfold at the time it was happening. The illustrations were created by eye-witnesses to the historic events. 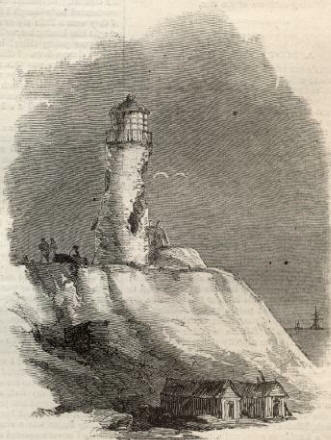 WE give on this, page sketches of Fort Morgan, the Light-house at Fort Morgan, the United States steamer Brooklyn, and the plan of the battle in Mobile Bay. The latter is official, as it is the plan which our artist drew for Admiral FARRAGUT. also, in the action on August 5, left its mark upon the vessels of our fleet. Of this the plan of the Brooklyn, given in the accompanying sketch, is a good illustration. The Brooklyn being the leading ship in the action, of course suffered especially. She was struck fifty-nine times in hull, spars, and rigging. She was hulled thirty-five times, and her mainmast was shot through four times. She was also considerably cut up in the port-side. Some shot holes are so situated as not to be shown. Admiral FARRAGUT, being on board of the Brooklyn a few days ago, remarked that he had never seen a ship so much cut up before. The other vessels were injured in proportion to their relative exposure. bustible matter communicating with oil and turpentine needed only a spark to ignite, and once on fire it was impossible to save the vessel. The Brandywine was an old line-of-battle ship. She was the vessel which carried LAFAYETTE back to his native country on his second return. She was one of the relics of olden time, now rapidly passing away to give place to the new order of affairs. The loss to the Government, with the stores, amounts to over a million of dollars. There are rumors that the ship was set on fire by the crew, but these are without foundation. The fire broke out in the forehold, and as there was a vigilant guard it was no doubt an accident. 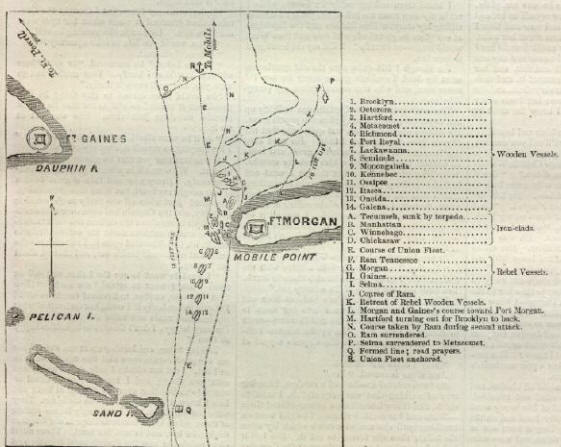 PLAN OF THE BATTLE OF AUGUST 5, 1864. THE " BROOKLYN," SHOWING THE SHOTS RECEIVED ON HER STARBOARD SIDE DURING THE ENGAGEMENT OF AUGUST 5, 1864. Are you Scared and Confused? Read My Snake Story, a story of hope and encouragement, to help you face your fears.